I'm on a carnivorous plant roll. Today I bring you Sarracenia Northwest, specializing in carnivorous plants for your home and garden with the slogan "No terrariums! No myths! No nonsense!" I'm almost afraid to ask "but what if I WANT to put the plants in terrariums?" Aside from the lack of terrarium love this site is a treasure trove of awesome photos and live plants for sale. They also have a monthly give away! Isn't that just such a beautiful colour. 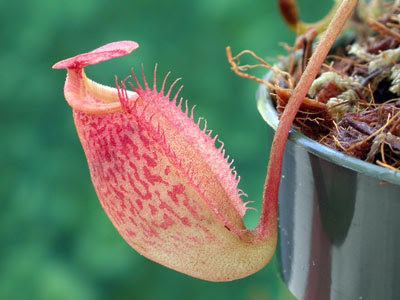 Hurrah for botanical carnivore love! Those nepenthes colors are unreal! Good find.